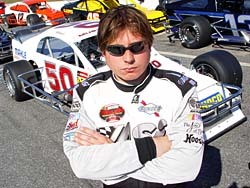 The marriage of Chuck Hossfeld and the Don Barker-owned #50 team is already perfect when it comes to qualifying on the NASCAR Whelen Modified Tour. The duo has entered one race and now has one pole, thanks to a quick lap of 18.750 seconds to lead time trials for the Icebreaker at Thompson Speedway (CT). Hossfeld thinks that he could have runs an even faster lap based on what he was able to do in practice. The run came with a minimum of fine tuning. 19-Year-Old Tyler Haydt was another driver entering his first race with a new team. 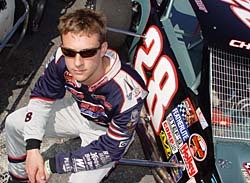 Haydt also had the added burden in the Icebreaker being his first ever NASCAR Whelen Modified Tour race – if he was able to qualify. Haydt passed that test with flying colors. He qualified the #28 Don King-owned car in the eighth position. Being able to take part in a day of practice last week at Thompson may have made all the difference in the world for Haydt when it came to qualifying. “We needed that practice on Thursday just to get all the bugs out and it didn’t go that smoothly,” said Haydt. “But today everything was gravy. We got along great, made good adjustments and the car just kept getting better and better. Last season, Ken Bouchard had a Icebreaker weekend that he’d probably like to forget. He did not qualify for the event in his #55 Modified. But what a difference a year makes. For the 2005 running of the race, Bouchard qualified seventh and will start the race on the pole after redrawing the number one pill. And even still, the 1988 NASCAR Winston Cup Rookie of the Year thinks that he could have gone even faster. Bouchard’s car at Thompson was the same on that he ran last season. Tyler Haydt fit right into his new ride. With another day left at the track and no dry cleaner in sight, Dupuis will race on Sunday with a less than immaculate racesuit. “It’s wearable tomorrow, but I was unsuccessful in my bid to try and clean it off here,” said Dupuis. Time didn’t just matter to Gregg Shivers on his qualifying lap. His #23 team already won a race before the pit gates even opened on Friday by just getting their new Troyer car to the track in time. “We fired up the car for the first time at 10:30 on Thursday night,” said Shivers. “We had it in the trailer at 2:00 Friday morning to leave to come up here [when gates opened at 9:00am]. Since the Shivers team is pretty much a self contained operation, there are plenty of man hours that go into getting a race ready for its first event. But the pride of a job well done was enough for Shivers. “It’s very rewarding know that just three months ago, this was a bare chassis and now we took it out on the track today and it’s all set to go racing,” said Shivers. There was something missing on the first day of the Icebreaker weekend on Saturday and that was that Ted Christopher was only at the track with one entry – his #13 Tour Modified car. His other ride for Thompson, a Sunoco (SK) Modified was nowhere to be found. That broke a very long streak. After the way that his day turned out, Justin Gaydash probably wished that there hadn’t been a brief “scuff” session before qualifying to prepare tires for time trials. Gaydash got into the wall in turn two during the session and that cost him a chance to get into the race. The wreck might have a lasting impact beyond this weekend when it comes to Gaydash’s season. Gaydash parks against the wall at Thompson. Another disappointed newcomer to the Modified Tour during qualifying was Kelly McDougall. 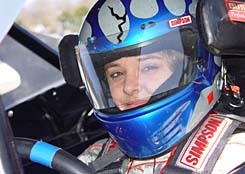 The former Sunoco Modified driver needed a little bit of practice before NASCAR would allow her to attempt to qualify. When problems sidelined her car during Saturday morning’s practice session, her team was told that instead of taking part in time trials, they would have to load up and go home. Although she was disappointed, McDougall understood the ruling and is already looking ahead to the future. “There are rules for a reason,” said McDougall. “We’ll go to Stafford. We were going to try and run the whole Tour. This is going to hurt, so we’ll see how the first five races go. 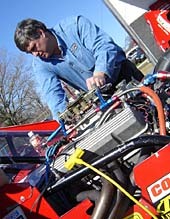 McDougall was entered in the #19 Motion Transport car that Eric Beers wheeled in 2004. With Beers moving to the Boehler #3 this season, McDougall has aligned herself with his old team. Whether they are known as Sunoco Modified (as they are at Thompson) or SK Modifieds (like at Stafford Motor Speedway or Waterford Speedbowl), limited Modifieds are the headlining weekly division at all three Connecticut oval tracks. The division was scheduled for twin features during Icebreaker weekend with one taking place on Saturday evening and the other during the Sunday racing card. and Bert Marvin. As the white flag flew, all three cars were grouped together. Civalli held back his two nearest challengers and took the victory. This is how the Sunoco Mods came to the line. Bouchard works under the hood of his #55. Dupuis got her feet wet during qualifying. Shivers has a new #23 at Thompson.